It’s possible that your business happens to have a seamless flow of IT infrastructure and policies that have been carefully implemented to create a successful network environment. What’s more likely, however, is that your IT infrastructure has been cobbled together over the years, upgraded in a piecemeal way. If this sounds like your company, you’re not alone. 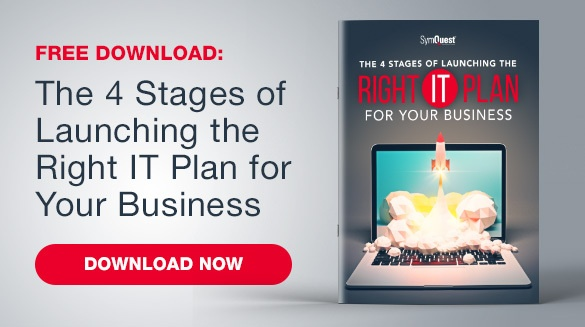 Many businesses don’t have an “IT plan.” They struggle to keep up with the latest IT best practices and only implement new technology when it’s absolutely necessary for operations. Without a strategic direction for your company’s information technology, you’re putting both your business data and bottom line at risk. So, why plan a business IT direction? It’s important to assess your current technology as well as future needs. As your tech infrastructure ages and your business grows, your IT needs will change. Understanding your direction will allow you to plan and budget for eventual necessary upgrades. When was the last time you took stock of your company’s hardware and software usage to determine whether a) you’re using these tools at full capacity or b) they need to be upgraded? An outdated IT infrastructure with no plan for the future is a risk to your business data and could be opening security vulnerabilities for your company. How can you get started on an effective IT plan for your business? First you need to identify the right direction. In the discovery phase, you’ll evaluate your current network’s design, functionality, and connections. 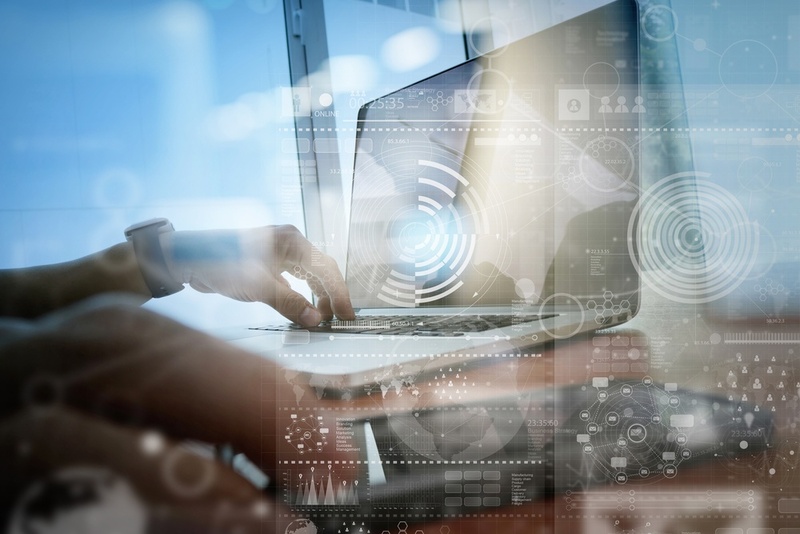 Whether you work with your company’s internal IT professionals or enlist the help of a managed services provider, an in-depth discovery period is the key to beginning your IT plan. Technology no longer plays a simple support role. For most businesses, a strong network infrastructure is a critical component of employees’ work every day. Since technology is so integrated into business, the first step in discovering your IT direction is to define your business goals. How is your business strategy connected to your sources of revenue? What stands in the way of earning more revenue? Do you envision your staff working in the office, in the field, or from home? On what devices? What kind of Recovery Point Objectives and Recovery Time Objectives do you need? In addition to your business goals and challenges, take time to review how your IT department operates today. What are your current IT management methods? How do you fund IT projects? All of this conversation helps to establish your contextual business goals. Once you know the answers to the questions above, you can compare your existing IT environment, architecture, and management model. By identifying gaps and exploring options, you’ll have an effective foundation for creating a solid IT strategy and budget. It is also a good idea to review employees that have recently been terminated to ensure they did not leave with hardware or software, especially if those technologies contained data or intellectual property from your business. You will also need to evaluate the software that is currently installed, or owned, by your business. Determine how they are meeting or not meeting your needs, whether there are any pending upgrades, and whether you’re considering replacement. It's also important to take into consideration those applications that are being used incorrectly and may require licensing to reach a level of compliance for your business. Again, it's important for you to know if any employee is using a free version of software, or if free versions have been replicated across multiple workstations to mitigate cost. Remember, it is your fiduciary responsibility to be sure your organization maintains clean and legitimate copies of software applications and licenses. It's also important for you to evaluate applications within each department. While some applications may be company-wide, such as operating systems, other applications may be used by only one department. Some of these singular-department applications include accounting software, purchasing or inventory control applications, marketing and sales platforms, or any software specific to one process within your organization. After your policies and procedures are identified, you will then need to determine if your organization has current Disaster Recovery (DR) best practices in place. Questions to ask in this phase include: is your data backed up? If your data is backed up, is it replicated to an on-site and off-site location? How often is your data backed up? How reputable is the organization that is storing your data? The final step in the discovery process is to determine your network requirements. While you may be thrilled to discover the assets you've uncovered in the inventory process, it's possible you will need to purchase additional hardware and software to get your network running at capacity. Consider the type of business you're leading. Does your business transfer a lot of data, or sensitive financial or healthcare information? If so, your network requirements may be very specific to your industry. You may require a longer file retention period, or more specific DR practices. Is your workforce primarily remote? Then you may need software applications that support a Bring Your Own Device (BYOD) model. 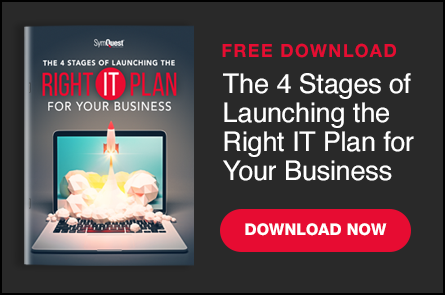 This five-step discovery process will help you get started planning an effective IT direction for your business. If the process seems daunting, that’s understandable; for many businesses, their IT infrastructure is out of sight, out of mind. If you’d like expert advice and guidance through the IT discovery process, request a network assessment from SymQuest and one of our knowledgeable team members will help you get started on an achievable plan that works for your business.